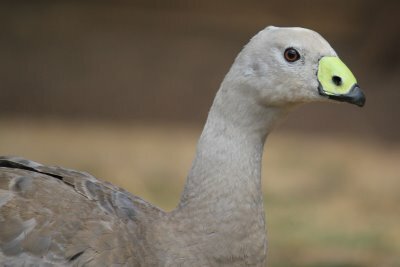 The handsome Cape Barren Goose is unique to Australia. During the 1800's they were hunted for food and eggs. Later they were destroyed as agricultural pests. These pale ash-grey, solid-bodied birds grow to about 90cm.Their most striking feature is a bright yellow/green bill. They mate for life and it is rare that I have seen a lone bird - they are always in pairs. They nest on the ground, making a shallow cup of twigs and grasses lined with down. A nest can contain from one to seven eggs. 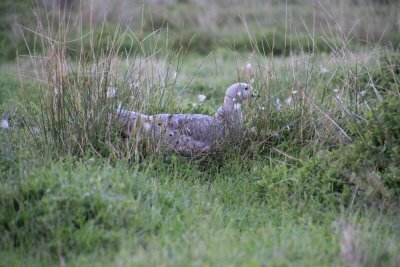 The Cape Barren goose is commonly seen grazing on grasses in paddocks around Phillip Island. The family of Mr Rob Niall of Melbourne had a very important role in saving the Cape Barren goose from extinction. 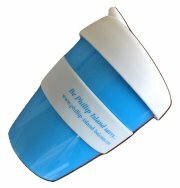 "Every time I visit Phillip Island there seems to be an increase in the number of Cape Barren geese. This gladdens my heart, not only because I like them, but also because they remind me of my grandfather and his role in helping to save them from extinction. My grandfather lived on a farm at Moorooduc, a place now known as "Nedlands Farm" that was until recently running as a lavender farm. He had an abiding love of birds, and his long driveway from the road up to the house was lined on one side with a series of very large wire enclosures. This is best described in some autobiographical notes that my father made, wherein he describes this aspect of his father's farm as follows. "My father had a magnificent collection of aviary-living birds and others. 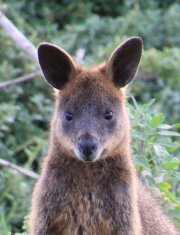 Among them were a Noisy Pitta, Mallee Fowl, Cape Barren Geese and many others. The aviaries were large, and there was a good-sized pond on which many water birds lived, including an Egyptian Goose, also known as the Nile Goose (and hence within the family as the Niall Goose). He also had what I believe was generally thought to be the best collection of pheasants in the Southern Hemisphere." My grandfather died in 1954, when I was six. But the image of that driveway is locked firmly in my memories, both for its intrinsic interest and for the wonderful rural experiences that lay at its far end. Of all the exotic birds it was the Cape Barren geese that most captured my imagination. I have no idea why. Perhaps it was their bulbous heads, their irridescent lime green beaks, their awkward gait, or their mellifluous honking. Or maybe their sheer numbers: grandfather had been successfully breeding them for a long time, and it showed. By the 1950s the Cape Barren goose was perilously close to extinction, a situation caused by various factors such as being used for food by sailors, and the inadvertent introduction of feral animals such as rats and foxes onto their preferred habitat, the windswept islands of Bass Strait. A rescue program was launched to save the species, but it soon hit a potential snag. There were so few left, and those that the authorities had access to were closely related. Inadequate genetic diversity threatened the program. Luckily someone involved in the program knew about my grandfather's long-established and successful breeding program. They contacted him and he provided the program with a lot of birds. The rest, as they say, is history. But a history in which I delight every time I see a Cape Barren goose, and every time I visit Phillip Island."